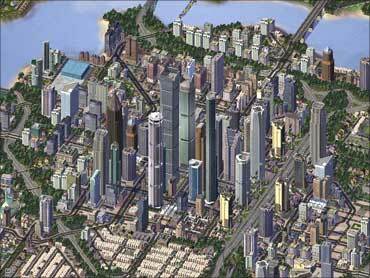 Rediff.com » Business » India plans 5 new mega cities by 2015! Navi Mumbai covers 345 sq km. In comparison, the size of the Dholera city that the Gujarat Industrial Development Board plans to build with private participation will be all of 360 sq km. Dholera is just one of the five similar-sized greenfield cities that India hopes to build in the next few years. They are Manesar-Bawal in Haryana, Indore-Mhow in Madhya Pradesh, and Dighi and Nasik-Igatpuri in Maharashtra -- all along the Delhi-Mumbai Industrial Corridor. 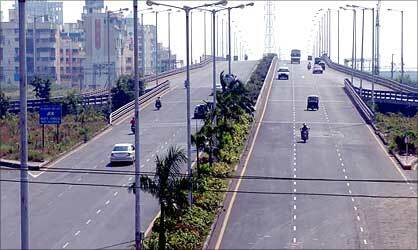 This means the plan is to have five brand new cities, which are bigger than Navi Mumbai, in the next five years. And the list is seeing new additions at a rapid pace. The Vijaynagar Area Development Authority in Karnataka has roped in the Centre for Enviromental Planning and Technology as architects for developing a new city in Karnataka. "The area has the largest reserve for iron ore in the country and the new city would come up in a 570 sq km area, which has been identified and earmarked," said Anil Roy, Assistant Professor at CEPT. 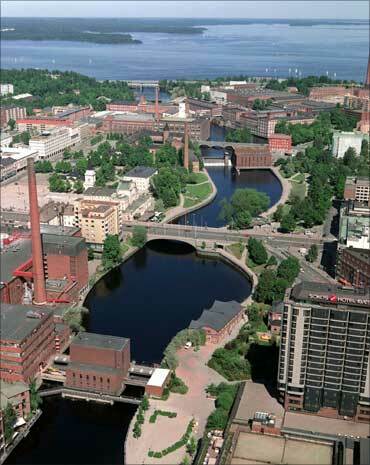 The new city would have a capacity to accommodate 5-10 million population, on the basis of estimates. Image: This is how it all begins, with a sketch. The Karnataka government also recently invited proposals to develop four cities of about 9,000 acres (around 35 sq km) each near Bangalore, according to a developer who has evinced interest in the project. "It is better to have newer cities than to expand," said Utpal Sharma, dean of planning & public policy faculty at CEPT. Sharma is leading a team of architects in laying out a plan for the Hyderabad Metropolitan Area, seen as an extension of the existing city. "An additional area of 450 sq km will be added, scaling the overall size to 760 sq km with a new airport." The Chhattisgarh government also recently came up with a proposal to develop a 'New Raipur' over 25 sq km. Amitabh Kant, managing director and CEO of DMIC Development Corporation, said Dholera has an area of about "560 sq km urbanisable area of which 360 sq km is developable". "It is bigger than what has been attempted in China or Korea so far. The first phase of the project would be completed by 2016. Dholera would attract two million population on completion," Kant says. GIDB already possesses over 50,000 hectares of land at Dholera. The cost estimate for infrastructure is estimated to be about Rs 38,000 crore (Rs 380 billion) and will create housing facilities for 500,000 people over 30 years, according to estimates by UK-based Helcrow who are doing the master planning for the city. 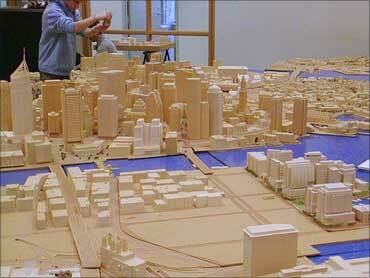 Image: Models of a city are being readied. The plan for industrial cities hasn't come a day too soon. According to a McKinsey Global Institute 2010 report, 590 million people will live in Indian cities by 2030, almost twice the population of the US today. But what could be a big bottleneck is funding. The success of these cities depend a great deal on getting private sector investment and the central government facilitating soft loans from multilateral agencies with a 10-year moratorium, at least. Even the McKinsey study acknowledges that. Building new cities is sustainable only when at least 300 to 400 million jobs are created and each of this city hosts a population of around 1 million, a landmark that usually requires strong anchor tenants and several years of incubation. A recent example of a big city coming up smoothly is the Hindustan Construction Company's Lavasa city project in Maharashtra, billed as India's largest hill city. 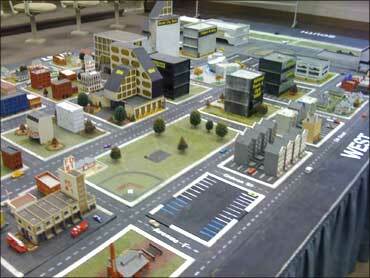 Image: City planning in final stages. Rajgopal Nogja, president of HCC Real Estate, said: "We have invested over Rs 4,000 crore (Rs 40 billion) in Lavasa of our total investment of Rs 47,000 crore (Rs 470 billion). The area will draw an overall investment of Rs 100,000 crore (Rs 1,000 billion). We are also interested in developing Dahej in Gujarat as a greenfield city, besides developing one city in Himachal Pradesh and in Karnataka." The Gujarat government came up with a Special Investment Region (SIR) Act in March 2009 for setting up new cities in the state, driven by industrialisation. About 12 such special investment regions have been identified and given to agencies for master plan so far with two more in the offing. These include Sanand, Dholera, Changodar, Santalpur, Hazira, Navlakhi, Simar, Pipavav, Dahej, Anjar, Okha, Aliabet, Savli and Halol. "The minimum size for an SIR is 100 sq km," sources said. Aliabet, which will house townships for the Japanese, has been identified as an entertainment zone SIR to come up on about 100 sq km, said sources. While Hitachi and Mitsubishi-led consortiums have been selected by DMICDC for laying out plan for developing 'Smart Cities' in Dahej and Chagodar respectively, Toshiba and JGC Corp-led consortiums will give shape to Smart Cities in the Maneswar-Bawal region of Haryana and Shendra industrial region in Maharashtra. Image: Palm Beach Marg, Navi Mumbai. The initial contours of the state government's massive plans to develop over a dozen new cities are slowly emerging. After Dholera, Gujarat government has put its plans to develop Dahej as a greenfield city on a fast track. As many as half a dozen companies including construction and real estate majors like Mahindra Lifespaces Developers(formerly known as Mahindra Gesco Developers), Unitech and Hindustan Construction Company (HCC) have evinced interest to develop Dahej, said government sources privy to the development. Also in fray is Marg Construction, a Chennai based real estate and infrastructure company, sources added. "The minimum size for developing Dahej city is 100 sq kms. The maximum developable area is about 350 sq kms," said sources close to the development. The estimated investment by a developer would be about Rs 10,000 crore. The bidding process for the project is expected to be over in three months time. "Gujarat Industrial Development Corporation (GIDC) has recently invited expression of interest from players with a seed capital of Rs 1,000 crore," sources said. The proposed area will have about 75,000 to one lakh housing units. Gujarat government came up with a Special Investment Region (SIR) Act in March 2009 for setting up new cities in Gujarat, driven by rapid industrialisation. About 14 such special investment regions have been identified and given to agencies for master plan so far with two more in the offing. These include Sanand, Dholera, Changodar, Santalpur, Hazira, Navlakhi, Simar, Pipavav, Dahej, Anjar, Okha, Aliabet, Savli and Halol. "The minimum size for any SIR is 100 sq km," sources said. Rajgopal Nogja, President of HCC Real Estate, said "We are interested in developing Dahej in Gujarat as a greenfield city, besides developing one city in Himachal Pradesh and in Karnataka." Aliabet, which will house townships for the Japanese has been identified as an entertainment zone SIR to come up in an area of about 100 sq km, said sources. 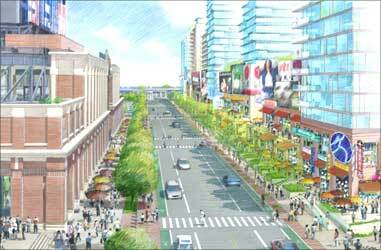 Dahej has also among the four Smart Cities planned on Delhi Mumbai Industrial Corridor. It will be built on the lines of Kita Kyusyu and Yokohoma of Japan. They will be made using smart technology, smart grids, smart water management and so on. There will be next generation energy management systems with zero emission industrial parks. A consortium led by Hitachi including Itochu, Tokyo Electric Power Company and Kitakyushu City have been selected for laying out a plan for Dahej. Following the enactment of the Gujarat Special Investment Region Act by the state government, Dahej has been notified as a Petrochemicals and Petroleum Investment Region. When fully functional, Dahej PCPIR - falling on the Delhi-Mumbai Industrial Corridor - is likely to touch the export target of Rs 62,000 crore (Rs 620 billion). The area has a special economic zone developed by GIDC in association with ONGC. Trains at 4,000 kmph? It's possible with ETT!